- High visibility LEDs and reflective glass elements incorporated into the Solar Base Parts help ensure safe driving at night. 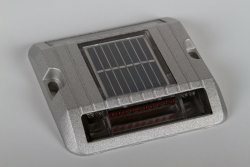 - The Solar Base Parts are solar powered, allowing them to be used in remote or stand alone applications. - High performance Nickel-Metal Hydride Battery along with completely waterproof packaging ensures maintenance-free, continuous operation for up to 5 years after installation. - Only clean solar energy is used; there are no hazardous materials in the products.